Some Fun Tips for Interesting Winter Landscapes | Faddegon's Nursery, Inc. Most of us stare at bleak winter landscapes for at least five, if not six, months of the year. That’s of course if you are not a ‘snowbird’. But there is no reason to throw up our arms in despair when the gardens are buried under snow. By making some simple wardrobe adjustments, you can have a dazzling winter wonderland that is both beautiful and less work than summer gardens. Here are some ideas. Plant flowering shrubs and trees with attractive bark. Deciduous red and yellow twig Dogwoods have striking bark that glows against snow. ‘Artic Sun’ Dogwood is a particularly striking cultivar with red and orange-yellow stems. To keep the stems a vibrant color, prune back the oldest stems in late winter or early spring. Stems older than three years lose their brilliance. Peeling (exfoliating) bark is interesting. I love birch trees. For those with smaller spaces, there are dwarf weeping birches that stay under 12’ like ‘Little King’. Paperbark Maples are gorgeous and will top out around 20’. Flowering shrubs with peeling bark include Ninebarks (Physocarpus), Oakleaf Hydrangea and Climbing Hydrangea. Evergreen shrubs and conifers are always a nice addition to the winter landscape. Rhododendrons, Mountain Laurel (Kalmia) and Japanese Andromeda (Pieris) are spring flowering shrubs. Some flowering shrubs stay semi-evergreen in colder climates including Daphne ‘Carol Mackie’ and Abelia. Red and yellow berried hollies are bold. Remember, you need both male and female hollies to have berries. Boxwood and Inkberry make zippy green structures and are also deer resistant. And the world of conifers is extraordinary. The choices are endless with sizes, needle colors and shapes. Deciduous trees and shrubs with unique branching habits can make great focal points. Some of my favorites are Harry Lauder’s Walking Stick (sometimes called contorted filbert), Redbuds (Cercis) and dwarf Japanese maples. There are also weeping or twisted varieties. Perennials left uncut in the fall are pretty, plus many serve as bird feed. Astilbes, Coneflowers, Black-Eyed Susans, Sedums, Sea Holly and Globe Thistle are excellent picks. 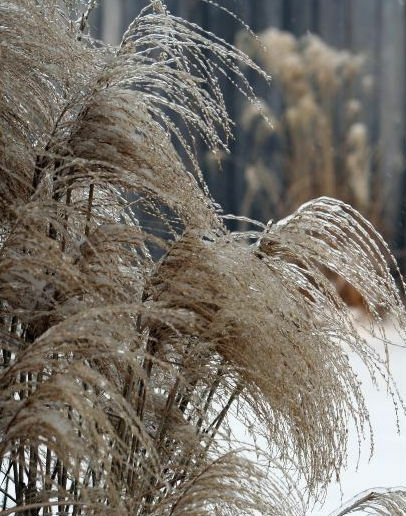 Ornamental grasses are stars of the winter landscape, especially the taller Fountain grasses. Garden statuary, benches, trellises, birdhouses and other inanimate objects dance on the winter stage. I bring in my ceramic containers to protect them from cracking but most everything else I leave out for interest. I particularly love an inexpensive bird bath I spray painted cobalt blue. It is striking against snow. Gazing balls are glamorous in the snow. I tuck large, medium and small balls around the landscape. Of course after a heavy snowstorm, they disappear for a while but soon their shiny surfaces reemerge. An even cheaper version of gazing balls is to buy Christmas ornaments at post holiday sales. The large ones designed to be hung from porches are ideal. Last year I picked up some glittery gold, ball-shaped twine ornaments. These were dazzling hanging from the branches of my miniature crabapple tree. You can easily make your own rustic balls by using grape or bittersweet vine. They look like huge ‘dust bunnies’ in the winter playroom. Let your imagination run wild! Fences, arbors and pergolas add winter interest. I’m a big fan of cedar and teak structures in snow. Dried flowers on spring, summer and fall flowering shrubs and trees are intriguing in winter. Hydrangeas are probably the number one plant used for this. My only advice is to remove spent flowers before winter on younger plants. Allow younger Hydrangea trees to mature a few years so their branches are strong enough to support the weight of snow or ice-covered flowers without tearing or breaking. Fruiting trees and shrubs add colorful berries to a white world. Holly, Winterberry Holly and Viburnum are popular picks. Witch Hazel (Hamamelis) flowers in late winter. Its orange, red or yellow blooms are a sight to behold. Most get 12’ – 20’ tall but there are some dwarfs like ‘Little Susie’ that only gets 4’. Okay, call me silly but I love the gnome smiling face on my oak tree. I look out at it and he always smiles back. I cannot say that for everyone in my house. You can get all different expressions as well as other cutesy figures.